Nothing starts my morning better than a delicious, nutritious Latte and reading a few of my favorite blogs. I am not a morning person. I never have been. Now that I have a child, however, I really have no choice but to try to be one. I cannot even open my eyes without a cup of coffee. First thing in the morning, before I take my son to the bus stop, I make a cup of plain old strong, hot coffee. When I come back, though, I like something a little more relaxing to help wake me up. Lattes are so incredibly easy to make at home, and they’re actually pretty good for you, so they are the natural choice to get my brain moving. Ever since I started reading blogs a few years ago, they’ve become a treasured part of my morning routine. 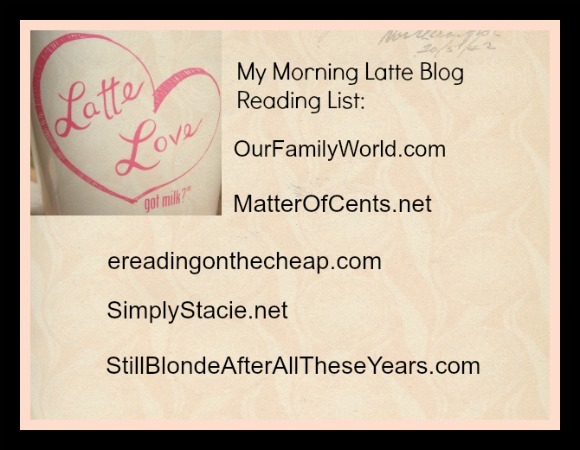 Drink my coffee (or latte) and check out what’s new with all my favorites. It was really difficult to cull down the list of the many blogs that I follow to just five favorites. It would be difficult to cull it down to 20 favorites! These are the blogs that I check faithfully, though, no matter what, not just for the content (which rocks) but because I’ve had a chance to interact with each of the bloggers behind the sites through various groups, and they’re all amazing women. 1. Our Family World – Our Family World is the first site I go to every morning, and not just because I write for it frequently. I love the magazine style of the site, and how I can find answers to just about anything. From saving money to making dinner to dealing with bullies, it’s just such a well-rounded site for families. 2. Matter of Cents – Matter of Cents has evolved so much since I started reading it last year. Now, it’s my number one stop for finding great coupons and deals. The fact that Adelina, the blogger behind the site, is one of the kindest and coolest people I’ve had the good fortune of “meeting” in the blogging world really makes me want to support her site even more. 3. e-Reading on the Cheap– If you’re looking for free or really cheap books to fill your e-reader, this is definitely a must-read site. I subscribed to the newsletter and check it every single day because many free books are only available for a limited time. Mandie does a terrific job of keeping me informed about a wide variety of genres, and I’ve found more free books through her site than any other. 4. Simply Stacie – Simply Stacie is one of the biggest names in the blogging world for a good reason. Her site is filled with the coolest new product reviews, giveaways, tips, recipes, and other awesome content. While that’s the reason I started reading her blog in the first place, Stacie herself is what keeps me coming back and earned her place on my favorite blog list. Her site may be huge, but her ego is not. Stacie is one of the first people to step up to help new bloggers learn the ropes and experienced bloggers learn a few new tricks. 5.Still Blonde After All These Years– The Chief Blonde is one of my favorite online personalities ( mere “blogger” is not sufficient to describe her!). She’s very real, vivacious, and total proof that women over 40 can have just as much fun, if not more, than their younger counterparts. While I still have a few years left before I hit the big 4-0, Chief Blonde makes that number a whole lot less daunting. From fashion to hairstyles to tips on surviving menopause, even if you’re not quite her demographic age group, you’ll still find loads to enjoy on her site. Why Lattes Instead of Regular Coffee? Lattes are surprisingly good for you, especially if you use low-fat milk. They’re a delicious way to get a full serving of milk, which we all know is important for healthy bones! Plus, they’re incredibly easy to make. Check out the video below for the 3-step directions, then head over to the Milk Mustache Campaign for great recipes and tips for enjoying your latte. Enter to win a Latte Love Gift set with a huge mug for your latte and a coupon for a free gallon of milk (any type, I used mine to get 1%). Giveaway ends 10/17 at 11:59PM, and is open to US residents 18+. Winner will be notified by email and has 48 hours to respond. Void where prohibited. I have a very similar morning tradition, but instead of a latte or coffee, it’s usually hot chocolate or my big bottle of water as I am trying to increase my water intake lately. But always it’s the first thing in my day after I get the kids out the door onto their bus. Then I settle down for a morning of great reading. I too love some of those great blogs you listed, and was introduced to some new ones! I drink a latte every morning! I love a lot of those blogs! A regular latte? I didn’t know there were different flavors?? LOL, I know 4 of those 5 blogs and they’re awesome! sounds delicious! Love my coffee! My favorite is pumpkin spice latte! Caramel Mocha is my favorite. I’ve never tried a latte, but I couldn’t begin my day without at least two cups of coffee. I actually do a Starbucks inspired latte- so totally not traditional! Chai tea instead of drip coffee, a shot of espresso, and a bit of coconut syrup then you add in your milk! I love the vanilla flavored ones, yum! I love a good caramel latte 🙂 thanks! my favorite latte is caramel! I’m a grande vanilla latte girl myself! 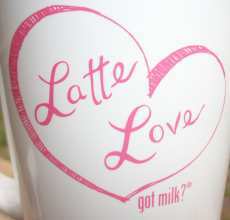 I love almond lattes, yum!